Hi there, I while back I had a little game here on the blog in relation with my new passion for this recently discovered technique for knitting socks, 2 in 1 socks. The winner of the game, won a set of 2 yarn balls of my hand dyed yarn to knit her first pair using this technique and in return I asked that the winner later share her experience with the rest of us. The winner was a knitter called MaryJo and this August I received her first account of this project. She has yet to finish her pair so we should be getting more from her later on. 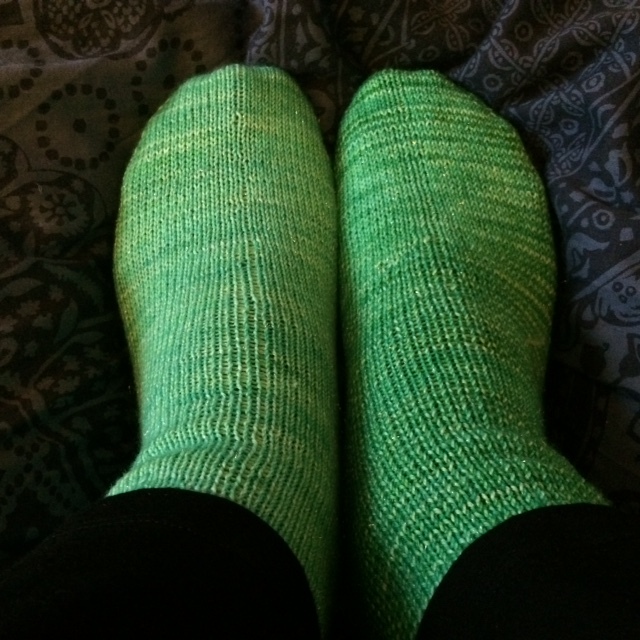 Just wanted to thank you for giving me the opportunity and the push I needed to knit two socks at a time, instead of me just saying “I’m going to do it someday.” And thank you for being patient while I got work under control and my daughter married off. I finally started these June 13th. 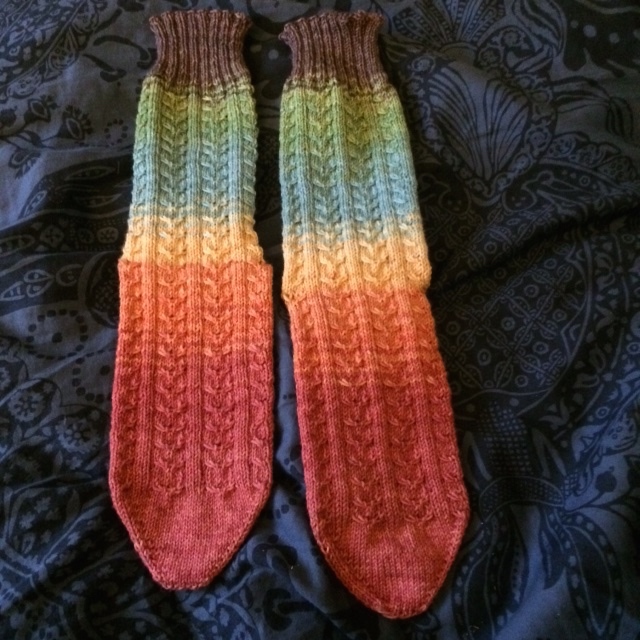 I figured I could do these without knitting the sample sock. So I cast on. 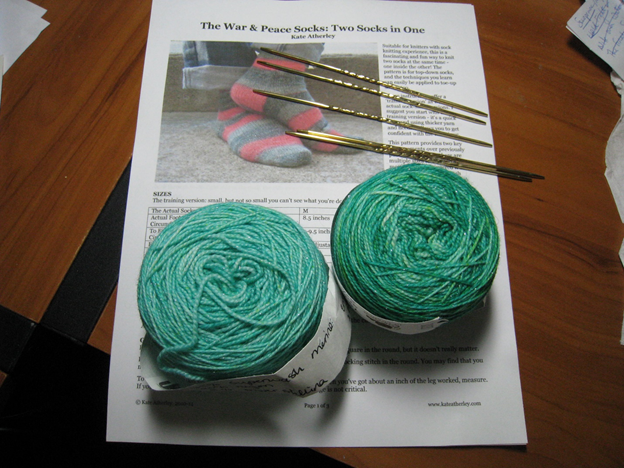 Had no problem casting on the one sock and then adding the second sock to the needles and joining in the round. The problem came when I started to do the ribbing. I thought I was following Kate Atherley’s directions on moving the yarn forward and back, but it didn’t work, was obviously not separated as it should be. Took it all out and redid it again. Still no luck. Took it out once more, and redid it. Nope, not right. Work at that point got busy again, so I put it aside, deciding when I picked it up again, I needed to do the sample sock. 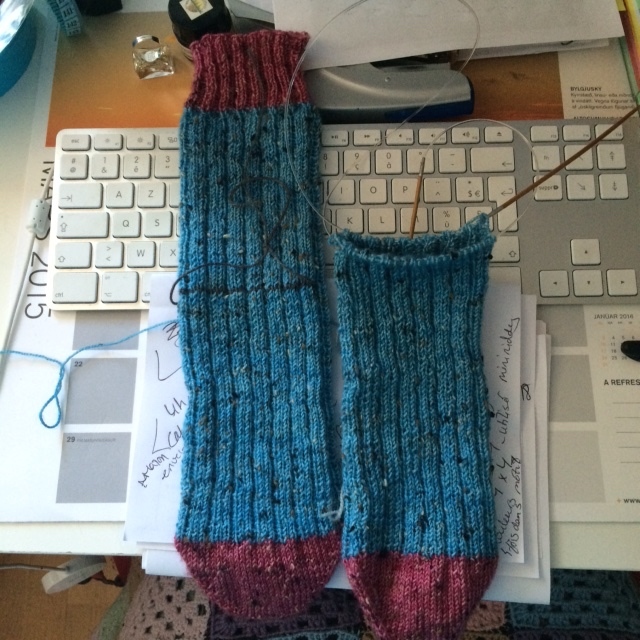 Once I figured it out, I stopped working on my sample and went back to the socks themselves. I would like to say that the ribbing on the socks went quickly, but it didn’t. I disliked doing it, and it seemed to take forever. I could only get two rows done before I would have to put it aside. 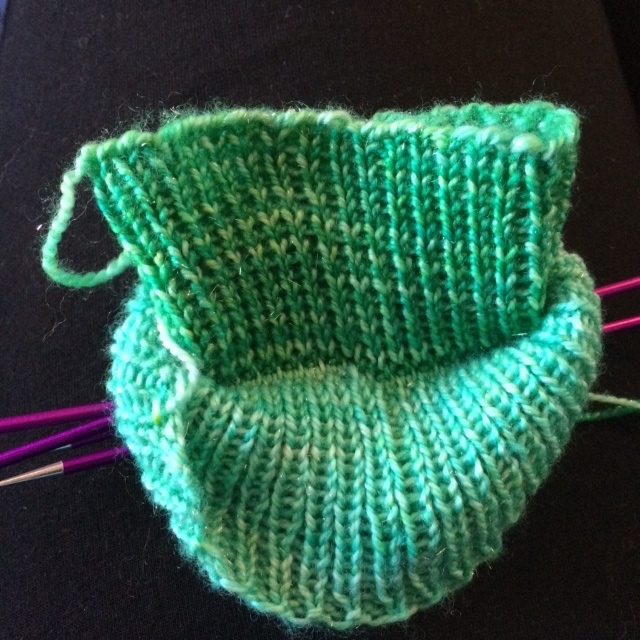 I persevered and by Saturday, I was ready to start the body of the sock. 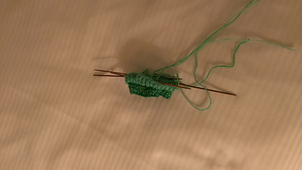 I have to say, it was kind of exciting to see the two socks separate as I was knitting the ribbing. 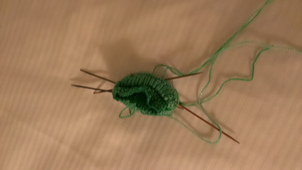 Breathing a sigh of relief that the ribbing from hell was over, I started purling the outside sock and knitting the inside sock. 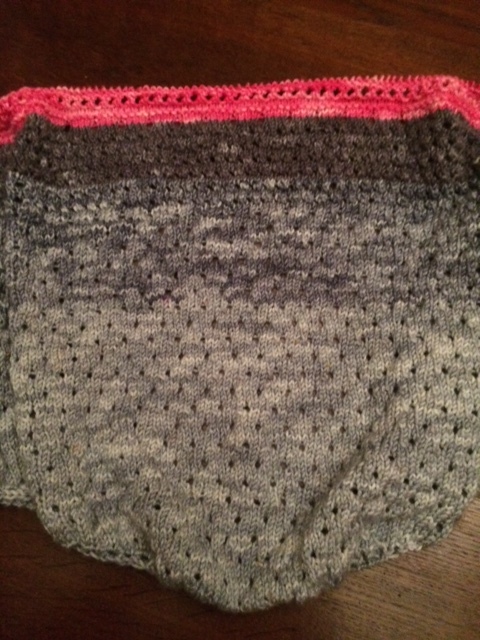 It was a little awkward at first as I throw my yarn and don’t knit continental and do very little colorwork. But once I got the hang of two-handed knitting, I was off. 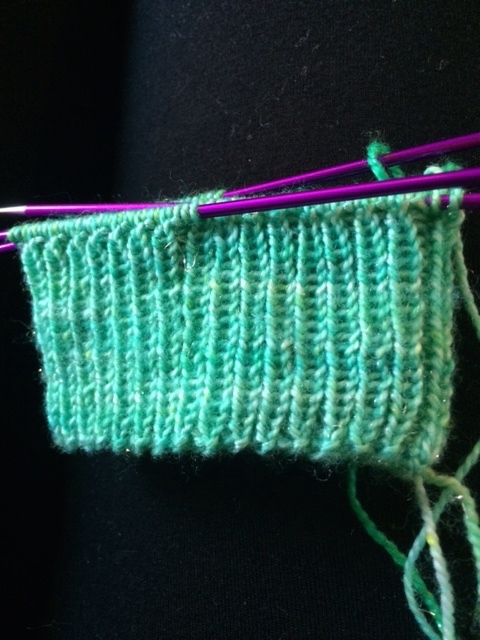 On the train coming home from New York, I was happily knitting away. Knit about an inch and then stopped to admire my two separate socks. Uh-oh. Somewhere near the beginning of the body of the sock I had one stitch that got messed up and my two separate socks were no longer separate. How hard can it be to drop the stitches down and pick them up again? Can’t be that hard, right? Wrong. 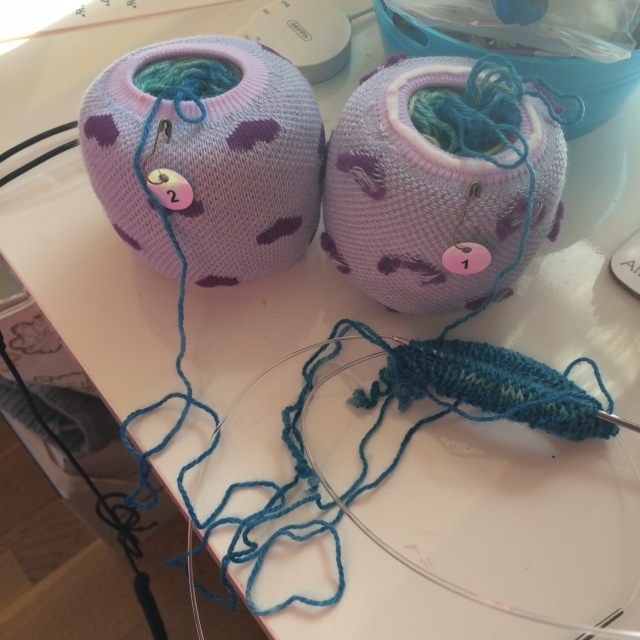 Trying to find the exact stitches, dropping them, and then picking back up was not as easy as I thought because of the socks being in the way of each other. I guess hard is not the right word, just kind of awkward and fiddly. Anyway, I fixed it and began to knit a few more rows. Uh-oh. Yes, it happened again. Into time-out it went for the rest of the train ride and until this past Friday evening when I had a chance to sit down with it again. Since it was only two rows back, I just tinked back a stitch at a time until I got to the errant stitch and fixed it. Learned my lesson, I’m checking after each row to make sure I haven’t crossed stitches again. I noticed I’ve got a little bit of laddering between needles, but that should work out when I’m done and give it a bath. I have about two inches done, so not sure how long it’s going to take me to get to the heel since I can only work on it sporadically. 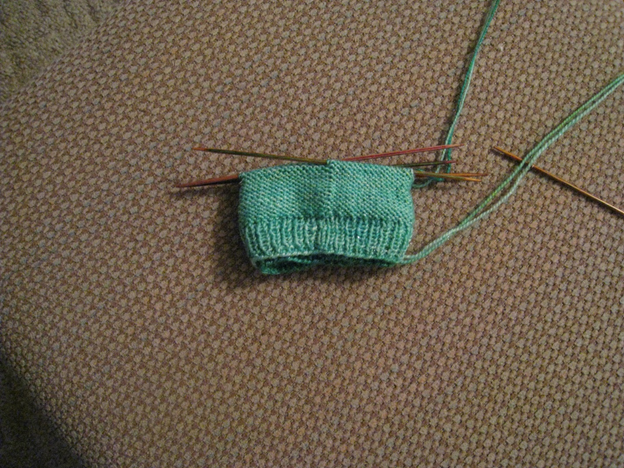 I’m keeping my sample close by for when I get to the heel, because I’m sure I’m going to need it then. I am enjoying learning new techniques with this sock and find it addicting. 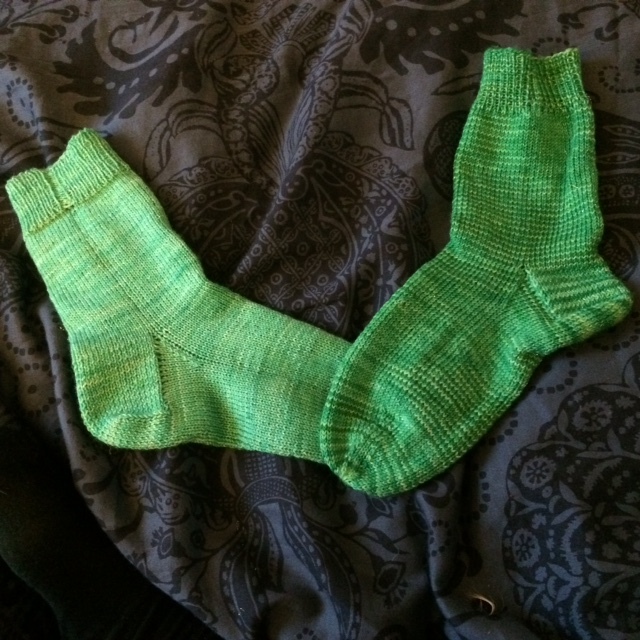 If I make them again, though, I would seriously consider doing the ribbing separate and then putting them all on one needle and starting the sock, if that would be possible. Thank you again for your patience. I will continue to keep you posted. Thank you MaryJo for sharing your first impressions of this new technique. I agree with a lot of the issues you had to begin with. I too disliked the ribbing part and I too found myself mixing my yarns up in just this one random spot making them siamese twins rather than 2 separate socks! But there is never anything “dangerous” with knitting and mistakes are there to help us understand and get better! I’ve stuck with this technique and I have now found my own method of knitting this way and I can even enjoy ribbing this way now. I do understand that this is a technique that does not suit everyone but it is fun to try, even if it is just once. I’ll be telling you more about this type of sock knitting in a later post and I might even do a video tutorial to show you how I now knit this way. 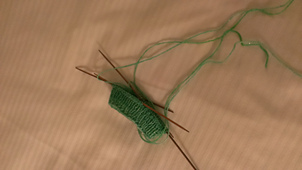 Also if you feel tempted to give this technique a try, I cannot stress enough the importance of first knitting the pair of test socks that Kate gives in her pattern. 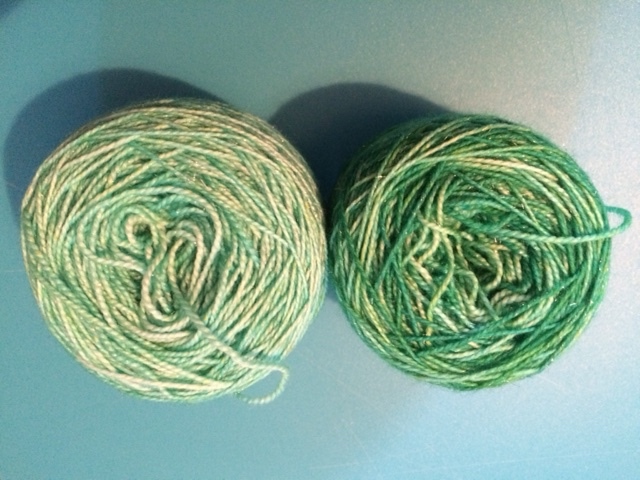 Using 2 different colored yarns in worsted weight will really help you understand how this works. If you don’t remember my previous posts on this technique you can click here for some further info. Lately I’ve been mostly working on my shawls. I’m almost done with the Pebble Beach Shawl by Helen Stewart of Curious Handmade. Her pattern for this shawl is in an original format, a bit like an excel sheet where you have the pattern written out in rows and each row is numbered from 1 and up and every so many rows you see the percentage of completion of the project. I find that quite fun for this project. Of course seeing the size I can imagine that I’m close to finishing but seeing the actual percentage of what I’ve done so far is a great new feature to a knitting pattern I think. 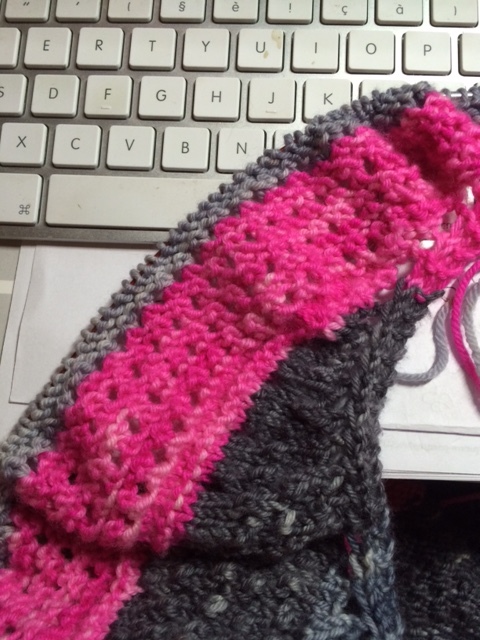 My yarn was gradient dyed in grey so you have light grey, darker grey and then really dark and to finish a bright fluo pink. What do you think? Do you think these colors will work? I sure do! I’m at 85% now so hopefully I’ll finish in 2-3 days. At this stage in the pattern, the rows are super long so the last few rows take forever to finish. 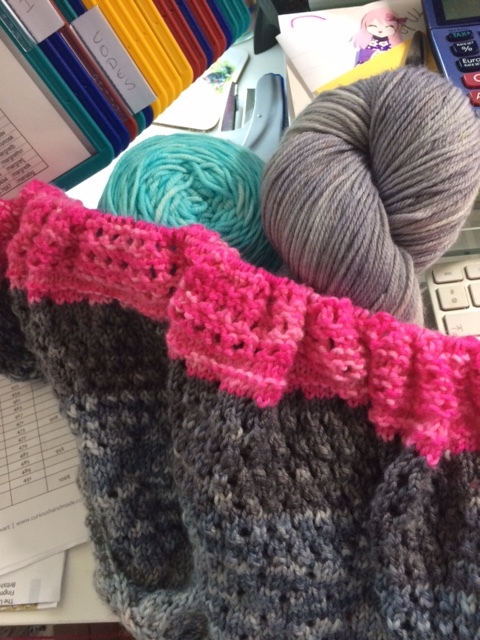 I’m also working on my Beetlebum shawl by Renée Callahan of East London Knits. I haven’t been sufficiently consistent working on this so it is going slowly but surely never the less. I really love how the pattern works up, I like the wings on each side and I feel this gives the shawl an original look. I’m super happy also with the yarn I chose. 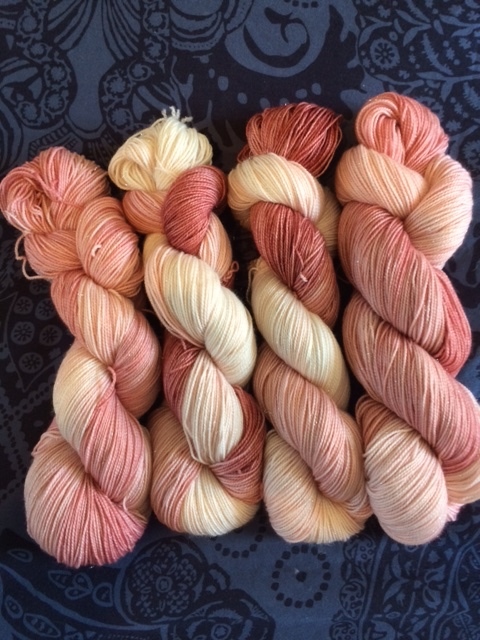 Its my hand dyed lace yarn, 50% xtra fine merino, 50% suri alpaca. It’s super soft and squishy. I’m really looking forward to finishing this and I can see myself wearing my Beetlebum shawl this summer in the evening. And just before I say goodby for today, I couldn’t resist all my new Lornas Laces Shepherd Sock yarns so I ended up casting on for a pair of socks. 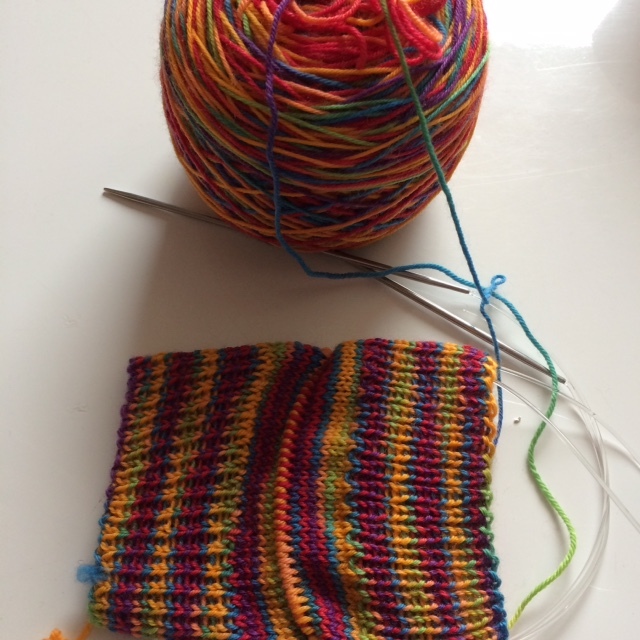 I’m doing a 2 in 1 socks using the Lornas Laces in Rainbow colorway. So far it’s looking very good. I really love all the bright colors and how they are divided up on the skein and hand painted. The socks will either be for me or for my daughter. We’ll see later on. Here you see the socks and I have “opened them up” so you can see both socks. Looking good don’t you think? So what about you, have you done any test socks yet? As before this is my glitter yarn with silver stellina for added fun and glam’ look. 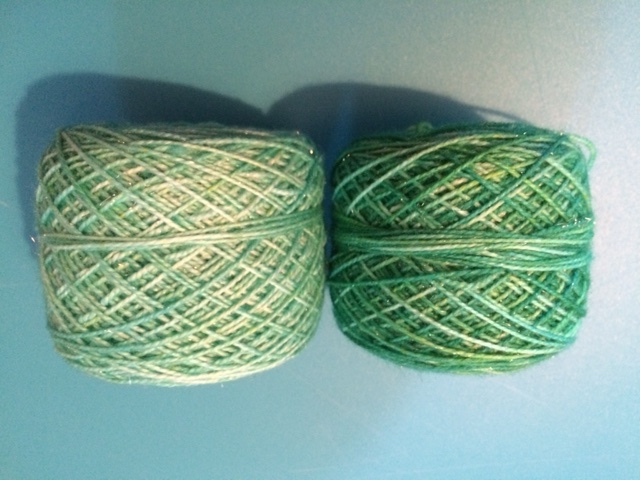 So the 2 middle skeins are really 3 coloured – hm how to explain. Well you have one part that is hardly dyed/coloured at all, one part that is light/pastel and the last part which is actually dark/saturated. 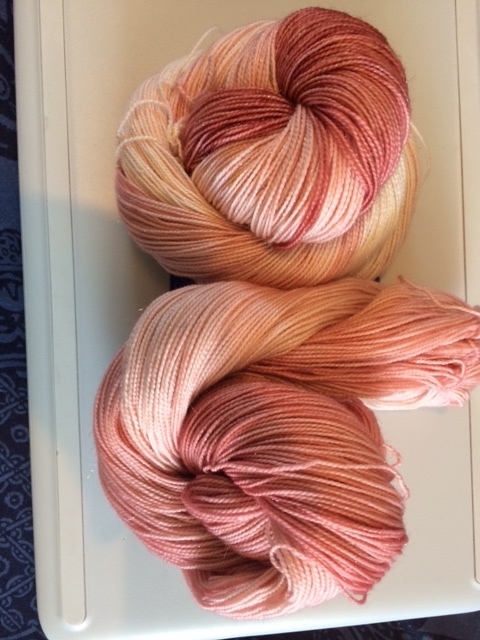 And then the 2 outer skeins have been dyed entirely although they do also have some variegation, but they do not have any undyed spaces and are more semi solid versus the 2 middle ones which are more like gradient/stripey. And on the topic of socks, just one progress photo before I leave you for today. 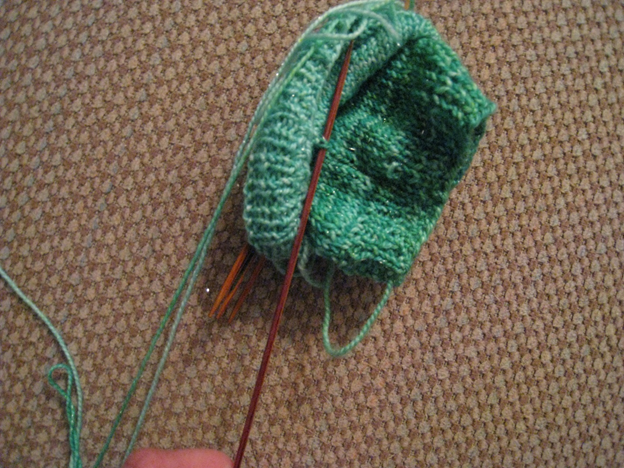 As always I’m working on a number of projects at any given time and now I have 3 socks on my needles. You’ve seen the 2 in 1 socks and I forgot to take a picture of my “tv watching” socks but here are my “at work” socks (shhhh don’t tell but when I can, I do some knitting between phone calls). 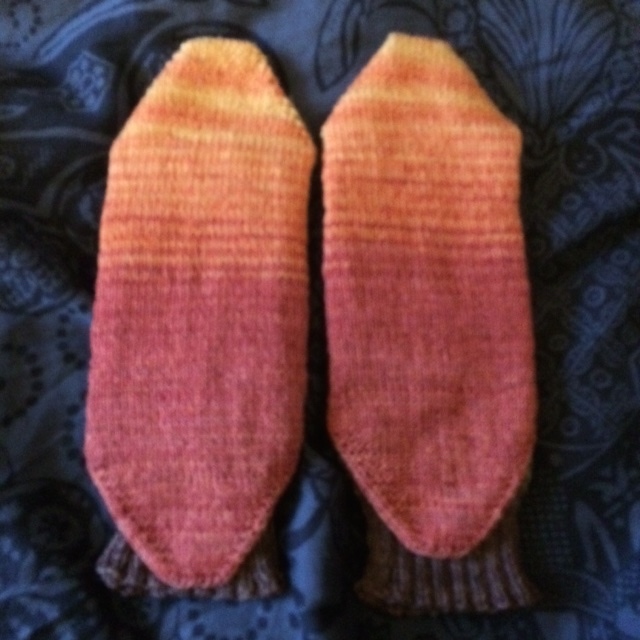 These are toe up socks with an afterthought heel knit with my own hand dyed yarn of course. 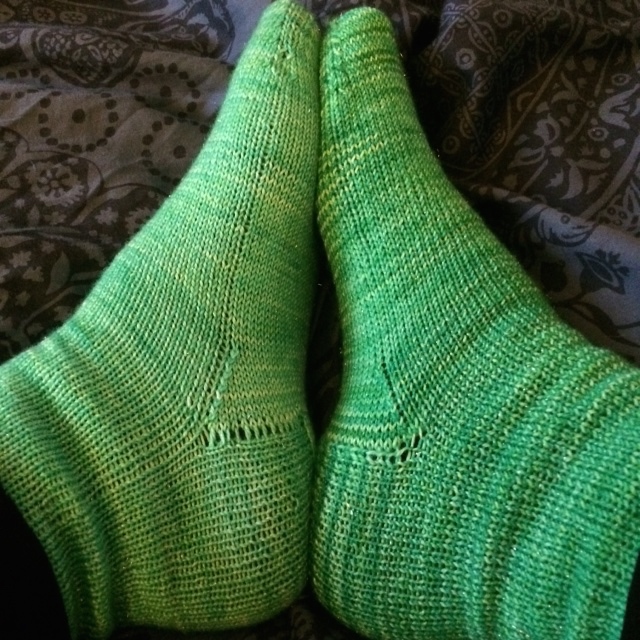 No particular pattern, just my imagination really for socks knit with 2 contrast coloured yarns. Thats all for today, thanks for stopping by and don’t forget to participate in the 2 in 1 sock knitting challenge if you have not already.